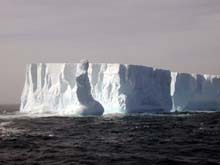 Huge tabular icebergs, calved from the ice shelf in the Southern Ocean's Weddell Sea. (Photo courtesy of Mike Vecchione.) Click image for larger view. 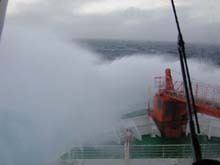 The German Research Icebreaker Polarstern in a Southern Ocean gale. (Photo courtesy of Mike Vecchione.) Click image for larger view. 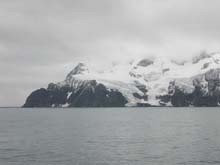 Elephant Island, where Antarctic explorer Sir Ernest Shackleton and his crew were marooned. (Photo courtesy of Mike Vecchione.) Click image for larger view. Until now, my polar experience has been in the Antarctic, where I have participated in three research cruises. One reason I have been looking forward to exploring the Arctic is for comparison with my southern observations. I should start by pointing out that the small areas I have visited don't represent a fair comparison of the two regions. For example, here in the Canada Basin, we are in open ocean 10 degrees of latitude closer to the pole than the area off the Antarctic Peninsula where I have worked. In a way, though, this reflects a fundamental difference between the polar regions. In the south, as you approach the pole you reach a continent that is surrounded by open seas. Conversely, the central area in the north is an ocean surrounded by land. Of course, there are similarities. The weather has been similar in the summers of each hemisphere. Temperatures are around freezing, a little higher during the "day" and a little lower at "night." I use quotation marks because there really is no night; it doesn't get dark. I have rarely seen the sun in either place, though. There are often clouds and fog, with frequent snow flurries (but not heavy snowfall) and only occasional patches of blue sky and sunlight. For me, the most striking similarity has been the difficulty in conducting research in either polar region. There aren't many opportunities for research at sea in either place. Not many ships are capable of safely working in ice conditions and it is logistically difficult just to assemble the gear and people and get them to (and from) the ship. As a result of all of these logistics, polar cruises tend to have many different research components, all competing for time and other resources. Furthermore, it is hard to keep the gear functioning properly in the cold and deep waters. For these reasons, none of the components can accomplish as much as the investigators would like. Right now, I find the differences between the regions most noteworthy. In spite of the similar logistical nightmares mentioned above, there are substantial differences in accessibility to the two regions. This has been the calmest of the two-dozen offshore expeditions in which I have participated. Because of the ice pack that surrounds us, the seas don't build up, and the ship hardly seems to move, except when it is breaking ice. In contrast, to get to the Antarctic, you have to cross a broad expanse of the roughest seas in the world, and once you get there, you face frequent storms originating in the supercold air overlying the continental glaciers and ice sheets. Once you get to your research area, you immediately notice visual differences. The ice is different. You occasionally get into pack ice in the summer off the Antarctic Peninsula, but it is more typical to work in open water surrounded by huge tabular icebergs calved from the ice shelves. Here, we have had sea ice, sometimes multi-year sea ice, all around us every day. You also don't see nearly as much life here. Aside from the very obvious difference that there are no penguins in the north, there seems to be a big difference in the occurrence of other bird species. Whereas so far we have seen a few gulls and very few other birds here, a ship in the Antarctic is always followed by a diverse multitude of albatrosses, petrels, fulmars, and other birds. Almost any time you get into southern pack ice, you see seals hauled out among the penguins. We have seen none on the ice here. The few seals I have seen have been in the water and well hidden. This reflects a major difference in the predators of the two regions. The top predators of the Antarctic, leopard seals and killer whales, dwell below the water surface. Here, on the other hand, the apex predator is the great white bear prowling on the ice floes. Seals don't usually haul out here because they are avoiding the bears. My overall impression of the part of the Arctic that we have sampled so far can be summarized in the word "desolation." For a biologist, no matter what group of organisms is of interest, it seems that you have to search longer and harder to find them here than anywhere else in the seas.